1 Who is Klay Thompson? 9 What is Klay Thompson’s Net Worth? 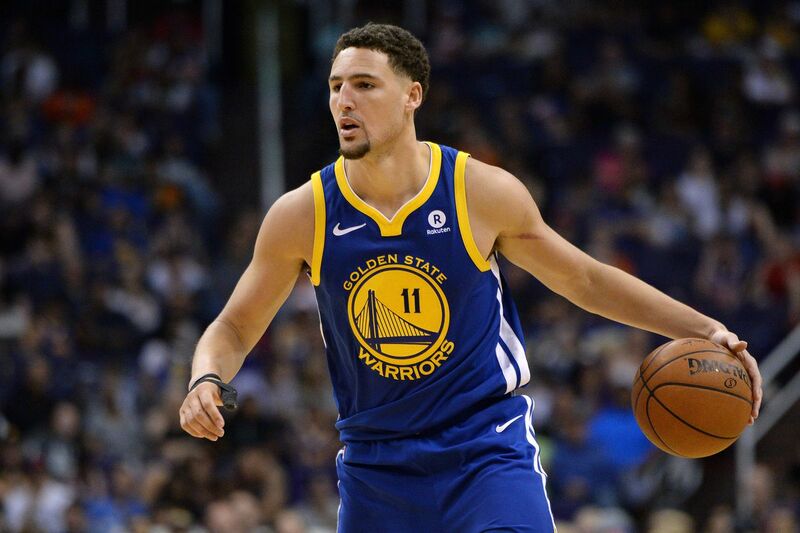 Born Klay Alexander Thompson under the sign of Aquarius on the 8th of February 1990, in Los Angeles, California USA, Klay is a 28-year-old Caucasian basketball player. He is perhaps best known to the world for being the shooting guard of the Golden State Warriors of the National Basketball Association (NBA). He has also had a number of other successes since he was drafted by the said team over the course of his often lucrative basketball playing career since 2011. Thompson was raised in Lake Oswego, Oregon, by his mother Julie Thompson and his retired NBA player father Mychel Thompson, who played for the University of Minnesota prior to being drafted as power forward (1st overall pick) by the Portland Trail Blazers in round 1 of the 1978 NBA draft. He later played for San Antonio Spurs and Los Angeles Lakers, and won two NBA championships in the latter team during the 1980s. Thompson’s mother was also involved in sports, having played college volleyball for the University of Portland and University of San Francisco. 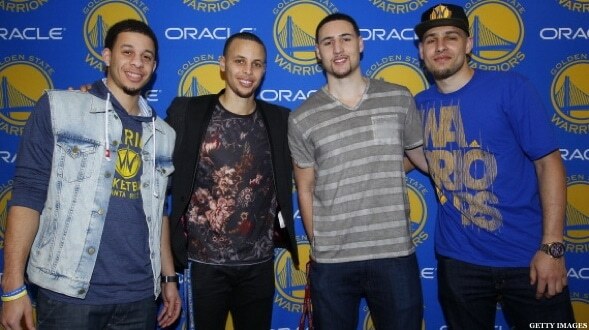 Klay is in the middle of three brothers – his older brother Mychel Thompson was born on the 1st of June 1988 and is also a professional basketball player, and his younger brother Trayce Thompson was born on the 15th of March 1991 and he is a professional baseball player. Upon his family’s relocation from his birthplace to Lake Oswego, at which point he was two years old, Klay met one of his now famous childhood friends – the current center/power forward of the Cleveland Cavaliers, Kevin Wesley Love. At the age of 14, Klay’s family moved to Ladera Ranch in California, where he attended Santa Margarita Catholic High School in Rancho Santa Margarita, matriculating in 2008. During his junior basketball season, he earned himself a place in the All-Area second team and the Orange County third team. During his senior year, he would average 21 points per game, thus greatly contributing to his high school’s 30-5 season record and earning them Division III State Championship attendance, where he set a state finals record with his seven 3-pointers in a single game. He was later named Division III State player of the year, as well as League MVP, an EA Sports Second Team All American and first-team Best in the West. Upon enrolling at Washington State University in 2008, Thompson marked his freshman year with the Washington State Cougars as his team’s leader in 3-point field goal percentage and free throw percentage, thereby averaging 12.5 points per game. This earned him a place in the Pac-10 All-Freshman Team and Collegehoops.net All-Freshman Honorable Mention Team. In his sophomore season, Klay helped the team secure a spot in the Great Alaska Shootout Championship, where he was named the Most Outstanding Player thanks to setting the record of 43 points in a single game. In his junior year, Klay was again the top Pac-10 scorer and earned All-Pac-10 first team honors. During this season, he also set the University’s single season scoring record with 733 points, which today makes him his university’s third all-time leading scorer. Klay dropped-out from his senior year, as he declared for the 2011 NBA Draft. Thompson was the 11th overall pick of the 2011 NBA Draft by the Golden State Warriors, for the position of shooting guard – the position he maintains to this day. Upon picking Klay, the general manager of the team Larry Riley stated that Thompson possesses good shooting ability and that his talent will flourish under the guidance of their new coach, Mark Jackson. One game after the Warriors traded the previously starting shooting guard Monta Ellis over to the Milwaukee Bucks, on 13 March 2012, Klay set his new season-high performance of 26 points in a game that they lost to the Boston Celtics. Next week, he beat that score by one point in a victory against the New Orleans Hornets. Following the end of this season, Thompson was included into the NBA All-Rookie First Team. 4 of em!? Neeeever seen it!! Having made a name for himself during his first NBA season, Klay became one of the most promising Warriors’ players. In the 2012-13 season, he and Stephen Curry set the highest record for the best shooting duo in NBA history, scoring a combined 483 three-pointers in a season. Next season, the aforementioned duo beat their previous record by one point, while Klay himself set his season-high performance at 38 points in the opening game. In the 2014-15 season, Thompson extended his contract with the Warriors by another four years, and set his then career-high performance of 41 points in the game that took place the next day, against the Los Angeles Lakers. In the 2015-16, he set his new career-high performance at 45 points, and over the course of the season, contributed greatly to making the Warriors the second team in NBA history to win 70 games in a season. The next season, he set a new record by becoming the first player in NBA history to score a total of 60 points in under 30 minutes of court time, then in the 2017-18 season, he became the 11th player in franchise history to pass the 9,000 point mark. Lastly, his current season-high is 52 points, while on 29 October 2018 he set an NBA-record of 14 three-pointers, one above Stephen Curry’s former achievement. On 23 October 2018, Thompson was taken off the court in the third quarter against the Phoenix Suns following an ankle sprain. To address the concern of the fans, the PR crew of his team announced that he had been diagnosed with a mild left ankle sprain, but that he would not be returning to the game. Aside from this accident, Klay had suffered another six on-court injuries prior, four of which took place in 2018, and two in 2017. At the moment, there is no information pertaining to Klay’s love life, except that he is unmarried – his only cohabitant is thought to be his dog named Rocco. As for his previous romantic endeavors, his first public partner was Bill Duffy – the two were apparently involved between early 2009 and late 2014. In 2015, he had a short affair with a Fordham basketball player named Tiffany Suarez, then in the same year entered a relationship with model Hannah Stocking. She broke up with him later in 2015 on the account of alleged infidelity, the details of which are still subject to speculation. What is Klay Thompson’s Net Worth? Have you ever wondered how rich Klay Thompson is, as of late 2018? According to various authoritative sources, it has been estimated that the total of Klay’s accumulated wealth is close to $38 million, made playing basketball for the Golden State Warriors, plus from sponsorships. As his career continues to develop, the said amount can be expected to increase. Concerning the physical attributes of the achieved shooting guard, his height is 6ft 7ins (201cm), while his current weight is 216lbs (98kg). His hair is pitch black and his eyes are dark brown, while his body shape is generally described as muscular. Due to the major influence of social networks, it is nowadays a custom for active celebrities to nourish a close and active relationship with their fans, for the sake of increasing the popularity of the projects they’re working on, and thus their own net worth. Klay is regularly active on the popular social media networks – his Facebook page has over 2.5 million followers, his Twitter account over 1.2 million, and his Instagram account over 5.8 million fans.